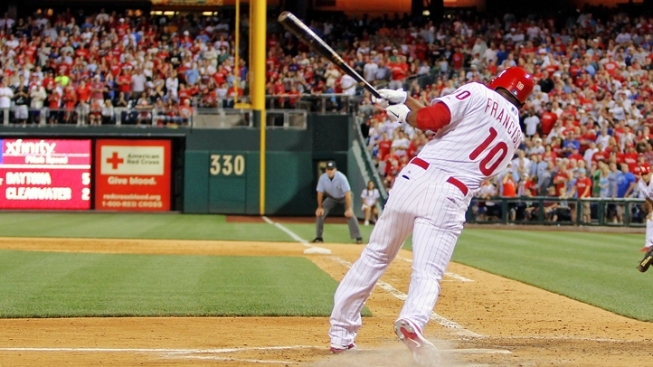 Ben Francisco's RBI single in the 9th gave the Phils the 1-0 win over the A's. Pinch-hitter Ben Francisco's RBI single with two outs in the bottom of the ninth lifted the Philadelphia Phillies to a 1-0 victory over the Oakland Athletics on Friday night. first. Francisco then hit a high bouncer over third baseman Scott Sizemore's head to drive in Victorino. Michael Stutes pitched a perfect ninth to get the win for the major league-leading Phillies. Four pitchers combined on the two-hitter. Philadelphia's Worley allowed one hit and walked four in six innings, tying for the longest of his eight career starts. Moscoso gave up two hits and walked three in a career-high seven innings. Hideki Matsui lined a double to left-center with two outs in the sixth for the first hit of the game. Victorino made a diving attempt for the ball, but it was way out of his reach. A disappointed Worley slumped off the mound as fans gave him a nice ovation. Placido Polanco lined a single to center for Philadelphia's first hit with one out in the bottom half. kept his foot on the base. This was the A's first visit to Philadelphia since playing at Veterans Stadium in 2003. The teams have split 10 meetings.